September 2010 is now behind us but the memories are still fresh on our minds through our pictures! 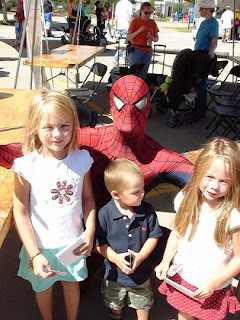 The kids kept busy going to the zoo, Children's Museum, Forest, Pinkalicious at the Rose, Vala's Pumpkin patch, visiting Super Heros, going to a Pirate Festival, and more! Chris took a little cross country flight with my Dad, too. We continued to add to our home by planting some trees in the back yard and painting the trim on the house. The honey do's will never be done!